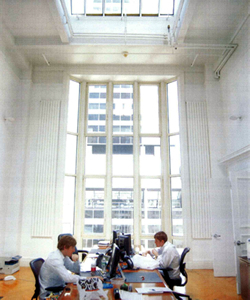 By definition a space that features "Good Sunlight Exposure" denotes that the commercial unit allows natural light to come in and bears one or all of the following details; unit stands in one of the building's upper floorplates, the unit overlooks a shorter height property adjacent to the tenant, and or the unit ejoys an eastern or west facing view. In any case this designation is only used sparingly throughout our office listings. With the average building height in Manhattan standing at 467 Feet tall or 38 Stories tall, it's important for us to identify only those commercial spaces that truely stand above the rest! "We already study circadian rhythm in sleep labs and find that ... light is the most important synchronizing agent for the brain and the body." Cheung and most recent study found that workers who had a window in their office had a much better sense of health. In short she says that exposure to natural light during the workweek tends to inspire people to exercise more, while staff with a window are also better rested according to the findings. Traditionally there are a few well-known commercial building sprinkled throughout the city known for their inspiring heights. These properties by all accounts feature sweeping expansive views of their local area and or even the city beyond. 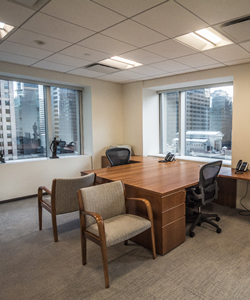 If your interested in leasing or pruchasing an office in Manhattan that features a great sunlit exposure, just give us a call - we have data on all the building proerties throughout city that bear the specific details your looking for - whether your in the market for an office facing a certain cardinal direction, a high floor plate, and or unobstructed views - we can help!